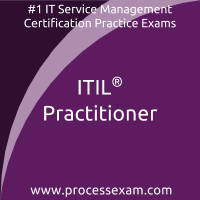 You have to pass the ITIL Practitioner exam to receive the certification credential. To increase the effectiveness of your study and make you familiar with the actual exam pattern, we provide the following sample questions. Our Sample ITIL Practitioner Practice Exam will give you more insight about both the type and the difficulty level of the questions on the ITIL Practitioner exam. However, we are strongly recommending practice with our Premium ITIL Practitioner Practice Exam to achieve the best score in your actual ITIL Practitioner Exam. The premium practice exam questions are more comprehensive, exam oriented scenario-based and exact match of ITIL Practitioner exam questions. To achieve the professional designation of ITIL Practitioner, candidates must clear the ITIL Practitioner Exam with the minimum cut-off score. For those who wish to pass the ITIL Practitioner certification exam with good percentage, please take a look at the following reference document detailing what should be included in ITIL Practitioner Exam preparation. The ITIL Practitioner Exam Summary, Body of Knowledge (BOK) and Sample Question Bank, provide the basis for the real ITIL Practitioner exam. If you have made this decision to become a certified professional, it is advisable to take authorized training and prepare with an online ITIL Practitioner Practice Exam to achieve the best result. 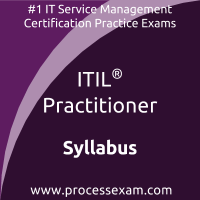 We have designed these resources to help you get ready to take ITIL Practitioner exam.